We’ve been looking at the advancements into autonomous vehicles as a natural avenue for Skynet to become activated. With all of the talks about neural networks, and massive simulated driving programs we are going to take a look at some of the companies and their products that you may know, and a few that are far from being household names. Some of which will never become household names for that matter. However all of these companies have the potential that their autonomous programs one day become self aware. A couple of the companies in our list have already had verified kills in the quest for self-driving vehicles. First up, and best known is Alphabet’s (Formerly Google) division called Waymo. Everyone who is anybody important says the are the defacto leader into this autonomous driving field. They have tens of thousands of vehicles on the road and drive millions of miles on roads that you share with them whether you know it or not. The entire field of the commercialized research and development can trace its roots to the Defense Research Agency (DARPA) who has been holding self driving vehicle contests for a while now. Coupled with the Silicon Valley ethos of move fast and break stuff, there are more autonomous vehicle research programs on the road than you can shake a stick at. Lets not forget that when these autonomous vehicles break stuff, they can actually kill people. Waymo – this is the former Google (now) Alphabet self driving vehicle initiative. They have most likely the the largest fleet of autonomous vehicles on the planet. They have recently breached 10 million autonomous miles driven. Using primarily Chrysler Pacifica’s like the one below. They have their eyes set on the current low hanging fruit for each of the companies that are working on Autonomous Vehicles, a self driving taxi service. Waymo has targeted launching an App, like Uber or Lyft in the Arizona area. Uber – After essentially buying the entire research arm of Carnegie Mellon University. Uber launched into a second place after purchasing Otto which was founded to automated large Class 8 semi-trucks. There have even been some legal disputes with employees Anthony Levandowski the alleged theft of intellectual property from Google; which have since been settled. They are officially the only company to have a verified death in their program to date. So if we are giving a Skynet score for kills, Uber is leading the pack. lyft – lyft has a very public website page for its activities in autonomous driving. Tesla Motors – Auto Pilot – Without a doubt the best named product on the vehicle scene; but poorest understood since it is not fully autonomous like defined as Level 5. The Auto Pilot feature has been very controversial for many YouTube videos popping up with Tesla owners not being in the drivers seat, sleeping, or otherwise being very distracted. The feature is available on Model S, and Model X vehicles. It has argued for future proofing its vehicles by installing self driving sensors into all vehicles and charging its owners at first delivery, or at a later time to activate these sensors to take advantage of some of the Auto Pilot features that were there all along. Also joining in on the intellectual property lawsuit space is Tesla who is suing Zoox, and a group of ex-Tesla employees now at Zoox for using Tesla data at their new employer. Auto Pilot deaths have been happening as drivers who own their vehicles have enabled the features, with deadly consequences. Drivers have already been using this feature when they have been so drunk they were passed out, like this California incident, however no one died. ZooX – another radical concept with a unique take on mobility, redesigning the idea of what a vehicle could look like. Using a test fleet of Toyota’s on the public roads to collect driving data for simulation. It’s fleet of ZooX vehicles look the same from the front and the back, as they don’t have a steering wheel. Apple, Inc – Rumored to have an on and of again love affair with creating either a Apple vehicle, sensors. One of the worst kept secrets is that the company has been working on Project Titan, which is their self driving platform. Ironically for a secretive program, it has a very detailed Wikipedia page. Nuro – New self driving car which is configured for delivery of groceries. So much like having a real life person drop off your groceries via service like Shipt, or you the old fashioned way like getting out on your own and picking out your own groceries. Kroger is one of the first companies signed on. As fast as Kroger signed on, they publicly exited their testing phase after about three months. Argo.AI – Ford Motor Company is the majority investor in this joint venture with Argo.Ai – this company is technically independent from Ford Motor Company, and is headquartered in Pittsburgh, PA not exactly the obvious choice for an artificial intelligence self driving vehicle company. However it is a hometown of the founders, and the university system . It’s vehicles can be seen driving around Pittsburgh and Dearborn, MI around Ford Motor Company’s engineering campus. Ford has launched in partnership with Dominos Pizza the ability to order pizza and have it delivered to you home via a Ford Fusion that is self driving in the Miami, Florida area. There are rumors that Volkswagen Group will also join as an investor in Argo.AI. Gm’s Cruise – While yes they are based in Silicon Valley, they are wholly owned by General Motors, and Softbank. This company is seen as the first place contender among the automotive OEM’s backing an Artificial Intelligence program. Having said that, it can be seen here in a Chevy volt EV failing to navigate around a double parked delivery vehicle. Currently there is not any major public releases of this technology for taxi service, or other delivery service like Ford Motor Company and Dominos. Range Rover – The high end SUV company has been hard at working testing their own Autonomous Range Rover Sport on the roads. Fiat Chrysler Automobiles (FCA Group) – most famously is paired up with Waymo as a partnership to use their Pacifica Hybrid minivans. However FCA is also doing some of its own autonomous research, but is much further behind the pack. In 2017 it partnered with BMW Group. BMW Group – more quiet than the likes of GM, and Ford on the autonomous front, they are threatening to introduce by 2021 an autonomous vehicle for sale to the public. May Mobility – An autonomous vehicle startup. They are already shuttling passengers around Detroit, Michigan, Columbus, Ohio, and Grand Rapids, Michigan. Their business model is different from most of the others with the exception of Navvya. Basically cities like Grand Rapids, MI, and Columbus, Ohio among others are sharing the cost of these shuttles to help augment public transportation services like buses and street car services. 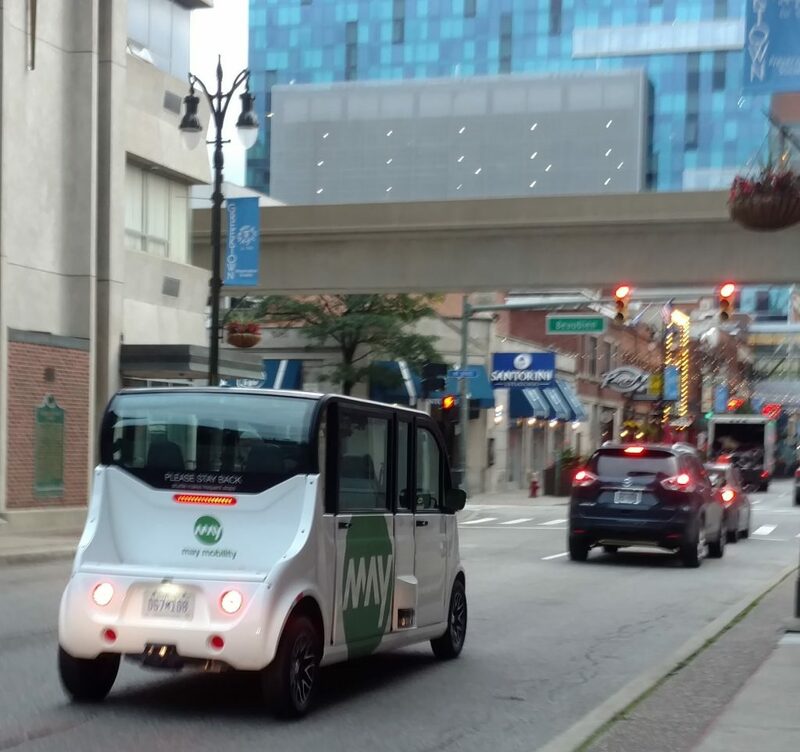 In Detroit, Michigan employees of one of the areas largest employers Quicken Loan can hop into a shuttle and get carted between office buildings downtown. Navya – Headquartered in France with an assembly company in Michigan. Back of the pack which is to say politely everyone else in the industry, or anyone that attempts to have a new program will be starting with a big seemingly insurmountable gap between them and first place. The contest at this point is to be a possible technology vendor that exists in the top 20 of all participating companies in this space so you can hook up with a traditional Automotive Original Manufacturer like General Motors, Ford Motor Company, Volkswagen Group, Toyota Motor, Hyundai-Kia, Honda, etc. Robert Bosch – have autonomous vehicles on the road in Michigan. 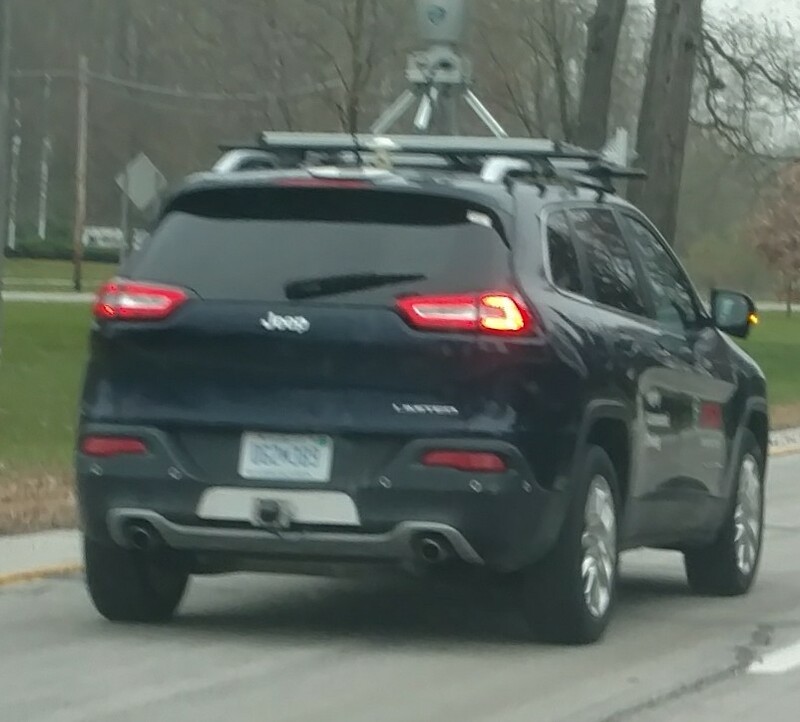 Using Jeep Cherokees with large overhead mounted sensors. CalmCar – Farmington Hills, Michigan based company. Similar to Tesla is only focused on visual sensors like cameras.